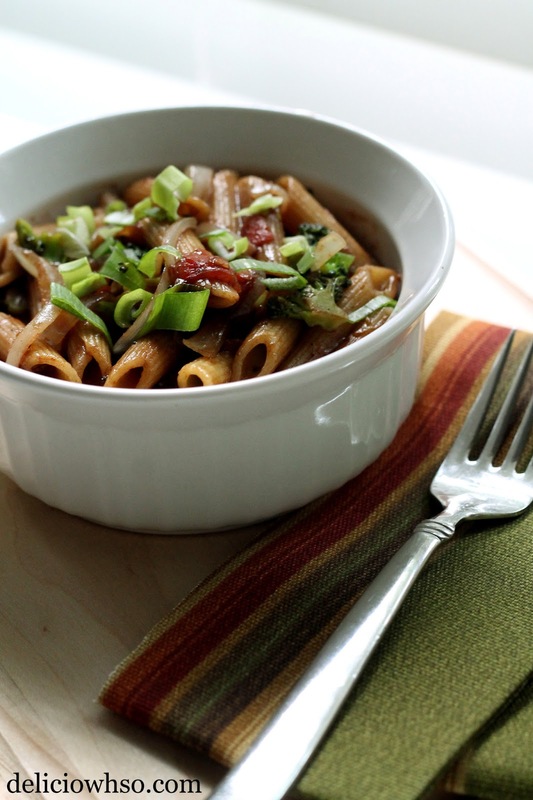 Pasta can be a quick, simple way to satisfy your hunger. I'm living at home with my parents while I'm on summer break since I attend school out of state. When my mom said that she forgot to defrost meat for dinner, we needed to come up with some solution. We didn't have any leftovers in the fridge or rice in the rice cooker... and I was getting hungry. I looked in the pantry to find 3 boxes of penne pasta. Looked in the fridge and found some tomatoes, broccoli, onions, and a bag of old spinach (how long was that in there?!). Of course i threw the spinach away, but I was able to use the veggies to make a meatless pasta. I love balsamic vinegar, and despite the tartness of the vinegar, the pasta came out mild but flavorful. The extra flavor of the herbs and veggies completed the yummy pasta and created a balance unlike the strong vinegar. For this recipe, it is important to use a high quality balsamic vinegar. A well-aged balsamic will have a pronounced natural sweetness that will balance out the tartness. A good balsamic will evaporate well, leaving a pasta that is not sour, but well balanced. I bought my balsamic and olive oil from a local olive oil tasting bar and boutique. It is all natural and has been aged 17 years! I used a Tuscan herb flavored oil that complimented the tart balsamic perfectly! 1. Boil water and add a couple pinches of salt to season the water. 2. Pour the pasta into boiling water. Cook almost completely, then strain and cool. 3. In a separate pot, heat oil. 4. When the pot is hot, add all of the vegetables. 5. Add salt, pepper, garlic powder and spices to the vegetables. 6. Cook until the onions are translucent, about 3-5 minutes. 7. Add cooled pasta to the pot with the vegetables. Mix to incorporate. 8. Add balsamic and olive oil to pasta. Mix well. 9. Add more salt, balsamic, pepper, or olive oil to taste, if needed. 10. Turn off heat, serve, and enjoy! I made this dish without any meat, but Italian sausage would pair nicely with the balsamic. If making the dish with Italian sausage, put the meat in before the vegetables and brown the meat before the vegetables are added.